It has been a couple of years since I reviewed the Ford Edge, I reviewed the 2017 Ford Edge Titanium. This time we reviewed two Ford Edge CUVs in back to back weeks, a 2019 Edge Titanium and a new trim for 2019, the Ford Edge ST. That’s right, Ford has decided to add the ST badge to their crossover, since they’re killing all their cars for North America, except for the Mustang. It is sad to see one of my favorite vehicles go, the Fiesta ST. Can a crossover replace performance oriented ST “hot-hatches”? Continue reading to find out. In Canada, the 2019 Ford Edge comes in four trims. The base SE has a starting price of $36,099, the SEL starts at $38,099, the Titanium starts at $43,499, and the new ST trim starts at $49,199; the ST replaces the Sport trim previously offered. Currently there is a $1,500 allowance off these prices. These prices are higher compared to the 2017 Edge we reviewed, however, Ford has AWD standard on all trims of the Edge now. Our two testers had a sticker price of $51,649 for the Titanium (not including $1,790 for “Destination & Delivery”), with $8,250 worth of options. Our Edge ST had a sticker of $55,949 (not including destination & delivery charges), with $6,850 worth of options. The difference between the staring price of the Edge Titanium and ST is $5,700, however fully loaded versions have a difference of $4,300. 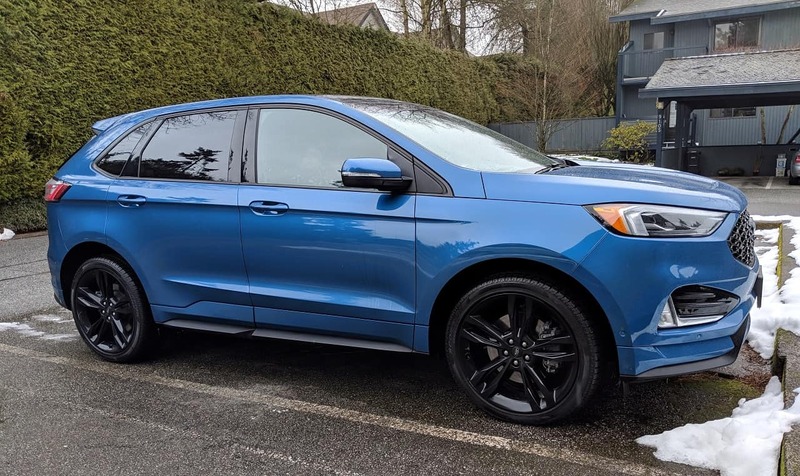 If it was my money on the line and I wanted all the bells and whistles in my Ford Edge, I’d go for the more powerful Edge ST. Unlike previous years, with the exception of the ST, all trims of the Edge are equipped with a 2.0 liter EcoBoost 4-cylinder engines. The Edge ST is equipped with a 2.7 liter EcoBoost V6 engine. The 2.0 liter EcoBoost 4-cylinder engines with direct injection, produces 250 horsepower at 5,500 rpm and 280 pound-feet of torque at 3,000 rpm (according to Ford, these figures were achieved with 93 octane fuel), mated to an 8-speed automatic transmission. The 2019 Edge’s 2.0 liter engine produces 5 HP and 5 lb-ft of torque more than the 2017 Edge, and has two more “speeds” on the transmission. The 2.7 liter engine on the Edge ST produces 335 horsepower at 5,550 rpm and 380 pound-feet of torque at 3,250 rpm (with 93 octane fuel), power is sent to all four wheels via an 8-speed automatic transmission. According to Ford, the 2-liter engine with AWD should consume 11.4/8.3/10.0 L/100 km in city/highway/combined driving. The 2.7 liter engine with AWD should consume 12.6/9.2/11.0 L/100 km in city/highway/combined driving. For our test/review, the onboard computer showed 10.8 L/100 km for the Edge Titanium, with 60/40 city/highway driving. On the Edge ST, the onboard computer showed 13.0 L/100 km with 50/50 city/highway driving. I’d say these numbers are decently close to the claimed numbers, I did have some spirited driving with the ST, which did increase consumption. I was expecting the 4-cylinder engine to struggle with the weight of this big CUV, but I was pleasantly surprised by way the power was put down to the road, the engine didn’t feel under powered and it did not struggle to move this heavy CUV around. At lower rpm, below 1,500, the engine did feel week, but once the revs were up and the turbo was called to action, it performed beautifully. There is a sport button on the transmission, which changes the way power is delivered by a little bit. The transmission holds gears longer and even downshifts under deceleration. However, I wouldn’t consider it a significant change in engine behavior in the “S” mode. The “S” button on the V6 ST, on the other, makes a big difference between normal and sport. The difference is embellished by the fake sound being pumped into the cabin when the transmission is switched from “D” to “S”. I personally thing the added sound is a bit much, not that it’s super loud, it’s just not needed in my opinion. The 2.7 liter V6 is obviously more powerful and is more fun to drive than the 2.0 liter 4-cylinder, but it also consumes more fuel. So, the question is, is the Edge ST worthy of the “ST” badge? The letters “ST” stands for “Sports Technology”, unfortunately there’s nothing really sporty about the Edge ST to warrant the “ST” badges. If anything, it’s just a more powerful version of the Edge, maybe they could call it…. I don’t know, the Edge Sport? (like they used to call it). I have a feeling Ford will be applying the ST badge to other CUVs in the future, because they’ve given up on cars, which is unfortunate. Putting the ST badge on their crossovers is a bit of a disservice to the ST badge, I think the SVT or SVO names would’ve been better suited on the Edge and any other future “performance oriented” CUV/SUVs. The interior on the Edge has stayed relatively the same and it shows its age. This interior was nice when it first came out and I even liked it on the 2017 Edge we reviewed, but for a vehicle that costs this much, it needs to be more upscale. The tech/features work great, but I’m not a fan of the overall look of the interior anymore; however, the average consumer isn’t going to drive over 50 cars a year like I do, so for most of them, this interior might just be fine. With Ford improving the interior of Lincoln vehicles recently, like on the new Navigator and Aviator, hopefully that design language will trickle down to Ford products. The interior is very room, with a good amount of room for 4.5 adults, the middle rear seat is not a place where an adult would want to spend a considerable amount of time. The seats are comfortable on the Titanium, the ST has bucket-type of seats, to hold you in place when you’re doing high speed cornering or drifting… okay, maybe not, bucket seats are a staple of the ST line, so I guess that’s why Ford put them on the Edge ST. If there’s one department the Edge (and other Ford products) isn’t lacking in, it’s tech/convenience/safety features. Like with all loaded Ford products, you can expect to get proximity key, push-button start, semi-automatic parallel and perpendicular parking, emergency braking, parking sensors, rear cross traffic alert, semi-autonomous cruise control, and much more. For a full list of available options, check out ford.ca. The Ford Edge is a pretty good vehicle, it falls somewhere between a small and a mid-size CUV; which is ideal for people looking for a decent amount of room without having to worry about driving/parking a bigger crossover.